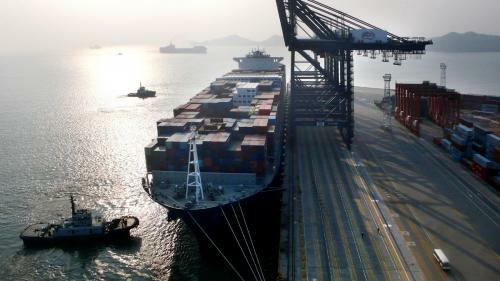 Hong Kong’s port operator COSCO Shipping Ports (CSP) delivered a strong throughput in the first half of this year, due to enhanced synergies with Ocean Alliance. However, CSP reported a 56.1% decrease in its net profit which amounted to USD 169 million in H1 2018, against USD 384.7 million in seen in H1 2017. In addition, the group posted an EBITDA of USD 339.8 million in the first half of the year, a decline of 36.3% compared to USD 533.4 million recorded in the same period last year. On June 30, 2018, Nantong Tonghai Terminal, which has three container berths and one bulk berth, officially commenced operation. The terminal has three container berths and one bulk berth. The annual handling capacity for container and bulk will be 1.47 million TEU and 5.37 million tons respectively. All the domestic and foreign trade companies will be migrated from Langshan Port to Nantong Port by the end of the month. Nantong Tonghai Terminal is expected to have a throughput of approximately 250,000 TEU for 2018, according to CSP. In May 2018, the group strategically allied with Port of Zeebrugge, the port authority of Zeebrugge which will acquire 5% equity interests in CSP Zeebrugge Terminal, and plans to develop the terminal into a strategic hub port. The group completed the acquisition of the remaining 76% equity interest in CSP Zeebrugge Terminal in November 2017 and made it a wholly-owned subsidiary. In an effort to boost growth, COSCO Shipping Ports also entered into a strategic alliance with GLP and Eshipping to develop terminal extended services and port supply chain platform. When looking ahead, CSP speaks about various challenges which remain in the second half of the year — Sino-US trade frictions, particularly, may negatively impact economic growth, according to the port operator. However, with a solid foundation laid, COSCO Shipping Ports remains cautiously positive about the prospect. “COSCO Shipping Ports will continue to grow its capacity with the ongoing support from the Ocean Alliance and the synergies with its parent company,” the port operator said. In addition, CSP will continue to optimize the cost structure and enhance operational efficiency against the backdrop of uncertainties casting a shadow over the macro environment. CSP’s terminals portfolio covers the five main port regions in Mainland China, Southeast Asia, Middle East, Europe and the Mediterranean.